The design stage is extremely important as it sets the stage for a solid foundation for your project and is an excellent communication tool to display just how Nature's Way can transform your space. One of our Landscape Designers will meet with you on-site to discuss your needs and desires. Your landscape plan is prepared based on our conversations and will include a detailed estimate as well as photos of the proposed plantings. When complete, we meet with you again to review the plan and discuss the specifics of how & why we designed your space the way we did. Just as a builder would never build a home without a blueprint, we never start a project without an approved landscape plan. Landscape construction is the aspect that brings your landscape design to life! As the landscape plan is the road map to where you would like to go, landscape construction is the vehicle to get you there. Nature's Way has excelled at this since 1976. Once you approve your landscape plan construction can begin! You will have a competent and well equipped Project Manager dedicated to your project; watching for any possible issues and to ensure that nothing but the highest quality job is performed and your project reaches its full potential. Proper garden maintenance is key to a beautiful garden. The greatest advantage to having your landscape professionally maintained is the peace of mind associated with knowing your plantings are being taken care of by individuals who are familiar with their growth habits. The knowledge of when to prune, how to prune, when to fertilize, or the removal of unwanted vegetation from the plant beds all serve to enhance the aesthetics and value of the landscape. While "zero" maintenance is unavoidable, it can provide an improvement on both mental and physical health. You may be surprised by the desire to get your hands dirty. And, if you find that you don't have a green thumb, Nature's Way is always happy to help with maintenance, especially in the spring and fall when gardens' require the most work. 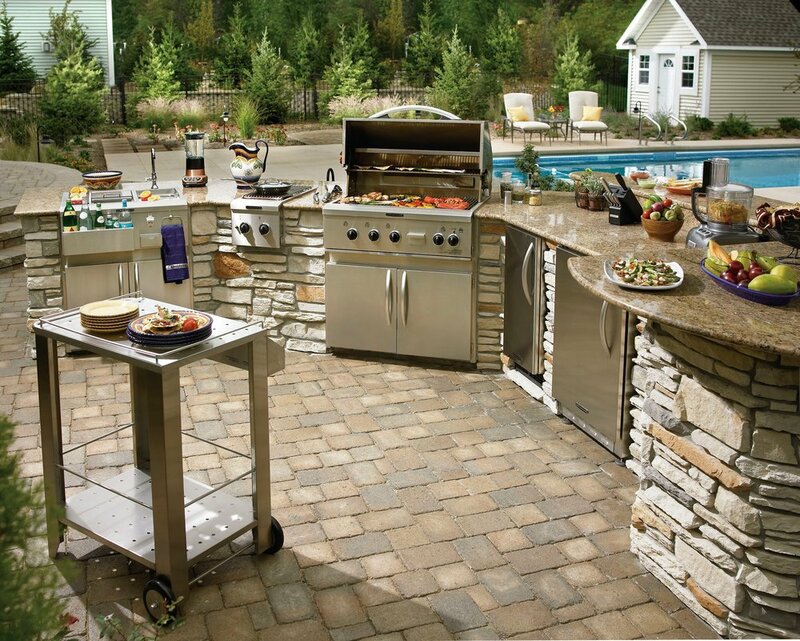 The term "hardscape" is used to describe such items as retaining walls, patios, walks, drives, etc. These are structural items of the landscape plan around which the plantings flow. Retaining walls can provide solutions to an otherwise unusable backyard and can also create privacy and add character to the site. Walkways direct traffic flow from one outdoor room to the next and connect the outside with the inside of the home. Blending the hardscape and landscape to create a comfortable, functional, and memorable space is our goal at Nature's Way Landscaping. When desired, Nature's Way Landscaping can incorporate water features to enhance your landscape and living spaces. Features such as ponds, waterfalls, and reflecting pools provide you with an interesting backdrop for entertaining as well as adding drama to your landscape. A properly placed water fountain will provide soothing sights and sounds that help you relax and de-stress. The sound of water can also drown out noise from traffic or neighbors. Reflective pools are effective in making a small area look bigger or give a focal point to an area that was once dull. Many people also enjoy the plant and wildlife found in water environments. Waterlilies and pond plants make the area feel lush and tropical. Fish can easily be added to ponds and pools and provide entertainment for children. Songbirds and butterflies love to be near water. 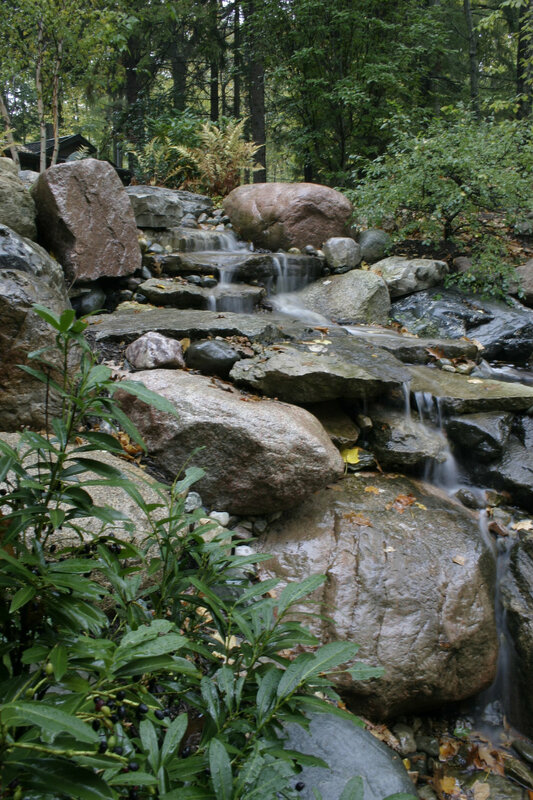 The benefits of owning a water feature constructed by Nature's Way are endless and will provide you with enjoyment for many years. The proper use of traffic patterns and setting up of outdoor rooms is a crucial element in preventing constant bombardment of kids over-running the "adult table" or repeated tripping over chairs and table arrangements. Rooms can be defined in many ways. Often, the simple proper placement of a tree can set up an entire area. Other times, rooms can be defined with patterns or lines in the ground surface, a water feature, or more permanent structures such as a built in bench or seat wall. The list can grow as wide as one's imagination. When incorporating so many elements within an outdoor space, a well designed landscape plan will determine the success of the entire site. While in use, the harmony of the spaces will be evident, even if only on the subconscious level as you enjoy a warm fire in the late fall or a cool swim on those hot summer days! Often called the "bones of a garden," structures such as arbors, gates, and gazebos add character and function to a landscape. Nature's Way Landscaping incorporates these structures to create privacy in your outdoor environment. They also help make outside areas feel like rooms as they provide a place to relax and unwind. Also, these structures continue to function as attractive landscape elements during the winter months. Arbors and pergolas add an element of interest to an otherwise flat garden by drawing the eye upward. They direct traffic, blend or separate different garden areas, and provide support for climbing vines. An attractive gate makes a warm welcome for guests. Gazebos are the perfect place to relax with a glass of wine or hold family dinners. Even colorful pots filled with annuals provide a focal point in gardens and help create a room-like atmosphere. Ultimately, these structures are the "accessories" of the garden and should be used where needed. AKA ambiance — the special atmosphere or mood created by a particular environment. Most homeowners want to create ambiance inside their house but what about the outside? Strategically placed lighting that illuminates the house after dark enhances the landscape and also increases the safety of the property. Enjoy more hours outside in the comfort of your home while creating an elegant atmosphere for entertaining long after the sun goes down. Many aspects of the landscape take on special beauty at night. Trees are spotlighted, casting shadows against the house. Even the drab concrete looks unique as sections of light glow across the cement. Safety concerns are addressed as well. With outdoor lighting, people can see where they are walking and there are fewer places for a potential thief to hide. A blend of uplights and pathlights give the property depth and beauty. The reflections on pools and ponds is another added joy found in landscaping lighting. Outdoor lighting systems are a wise investment. The goal at Nature's Way is to create a refreshing lighting plan that does not over saturate your property. Too many lights can cause the area to be overly bright and in turn takes away from the landscaping. It is our job to create landscape lighting that fits your residence. Because lighting is easily installed during landscape installation, our designers can help you through the entire design process so that the landscape and the lighting blends together naturally.